Whole record has pre echo throughout. Beginning of 1st song trumpet is distorted and crackly for first minute or so. This remaster for CD is absolutely great. The only thing that beats it is the Music Matters remaster for vinyl. Great remastering, excellent artwork. Well recorded. Nice pressing from Music Matters. Great music. My (Dutch) copy looks to be from 1978 rather than 1977. Early Liberty versions still have NY USA on the label, but there is no Plastylite "ear" symbol in the deadwax. Initially searched for MMBST-84085 and no results were generated for the 33RPM Music Matters releases. I was notified this is a duplicate of https://www.discogs.com/release/9659662 which was not presented in the search results. I recommend removing or merging with https://www.discogs.com/release/9659662. Trumpeter Freddie Hubbard had a tremendous run with Blue Note in the early sixties and Ready for Freddie is no exception. This record was made during a period when Hubbard, like pianist McCoy Tyner (also on this set), were alternating between hardest-of-the-hard bop sessions and more experimental music with the likes of John Coltrane, Eric Dolphy and Ornette Coleman. 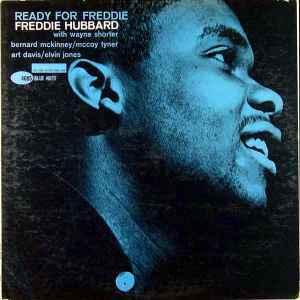 Three of the five tracks on the original issue of Ready for Freddie are Hubbard compositions, two of which are amongst his best-known ("Birdlike" and "Crisis"). The Jack Elliott/Victor Young ballad, "Weaver of Dreams" features some tender horn work from Hubbard while the Wayner Shorter-penned "Marie Antoinette" is a quirky, bouncy, mid-tempo showcase for the soloists.